Prevents drunken driving among 18-20 year-olds and the rest of the population. Advocates of the 21 year-old drinking point to the fact that since the drinking age has been standardized at 21 drunken driving fatalities have decreased by 13% amongst 18-20 year-olds. Furthermore several studies that measured alcohol related traffic fatality rates over the period in which the drinking age was changed to 21 from 18 preceding the standardization in 1987 found a decline in drunken driving amongst the affected age group. This pattern of decline began in the early 1970s, years before passage of the National Minimum Drinking Age Act. During the 1980s and 1990s, legislative changes, increased law enforcement, tougher prosecution and punishment, highly visible advocacy, and public education were all components of the “war on drunk driving.” Other legislative changes, such as mandatory seat belt laws, lower BAC limits, and stricter rules on automobile safety standards can also be credited. The decline in alcohol-related fatalities seen in the United States over the past two and a half decades is attributable to a combination of factors, including but not limited to safer vehicles, increased public awareness of the danger of drunk driving, use of designated drivers—a term that did not exist in the before the drinking age was raised—sobriety checkpoints, zero-tolerance laws for young drivers, and altogether more stringent enforcement of alcohol-impaired driving laws have led to the reduction seen in rates of drunk driving and related deaths. In fact, many of these improvements can be traced to the 39 recommendations presented by the Presidential Commission Against Drunk Driving in 1982. 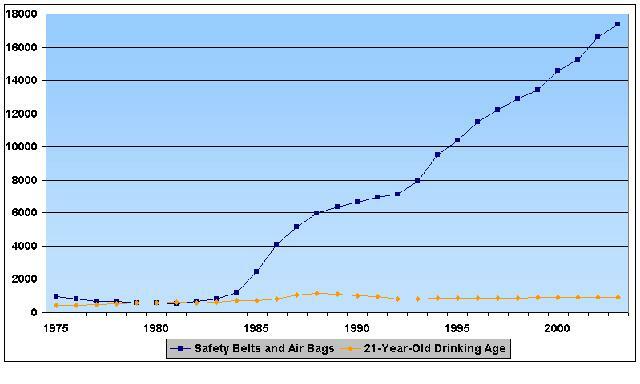 According to an analysis by NHTSA, safety belts and air bags have had a vastly greater effect in preventing fatalities than the 21 year-old drinking age; for example, in 2002 and 2003 alone, more lives on the road were saved by the use of safety belts and airbags than there were in the entire history of the 21 year-old drinking age.